Reynolds’ charge catches Govan’s brigade completely unprepared and squarely on the flank. The brigade routs and moves west. Reynolds’ division begins to diverge, with Robinson heading northwest toward McCook, and Turchin north along the Lafayette Road. Baird’s division is putting up a stout defense. Jackson’s Brigade is stopped by Scribner and King’s Regular Brigade. Starkweather’s brigade brings Polk’s Brigade to a halt, routing the 35th Tennessee. Calvert’s Battery moves up for close artillery support. Breckinridge’s Division moves forward to support the advance. Palmer’s division and Berry’s brigade make a fairly orderly retreat across Kelly Field. 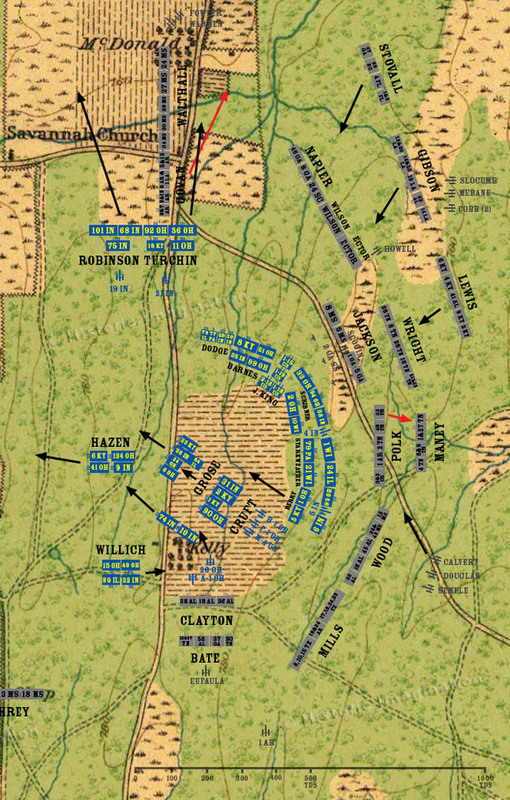 Battery A, 1st Ohio engages the Stewart’s Division, and General Willich shifts two regiments into Kelly Field to slow the Confederate advance.